Let's be honest, it's difficult shopping for our parents. 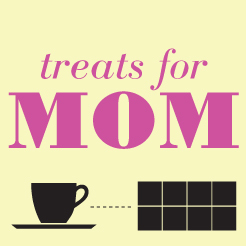 You want to get mom something she really enjoys where there's an experience behind it. It should last, but not collect dust. We're going to make it easy (and very affordable) for you. We will pick three 4 oz. bags of coffee from our lineup and an Askinosie bean to bar chocolate and put in a box for you. All you have to do is wrap it, if you want, put a bow on it, or seal it with a kiss. All done. Orders must be made by May 5th. Your purchased set will be available the week of May 6th. We will contact you via email for confirmation and chocolate selection after we receive your order. *Product info: The coffees we carry are some of the best in the world. We change our lineup frequently to keep product fresh, and we have carried coffee from over 70 roasters. All coffee has been roasted within 2 weeks that will be selected for these sets. We have four different Askinosie bars that are available for this set. This price does NOT include shipping. Pick-up or delivery only (if you see Jason or Kent regularly). If you want your package shipped please contact Jason and we can take care of you.